I had the pleasure of watching the movie FAT HEAD last week. It was an amusing, thought-provoking film and it did a great job of debunking Super Size Me‘s myths and showing the disastrous effects of government interventions/conflicts of interest. The Guy from CSPI – The Center for Science in the Public Interest ran an article in 1988 entitled “The truth about trans: hydrogenated oils aren’t guilty as charged“. CSPI claimed trans fats were not as harmful as scientists were claiming… years later they did an about-face and demanded restaurants discontinue using trans fats for frying… the same trans fats they recommended! Street interviews – Tom Naughton, the producer of the film, asked people whether McDonald’s meals were high in calories or low in calories. He also asked what they would do if their child were obese. This was a humorous way to show everyone knows McDonald’s food is unhealthy and suing a fast-food chain for childhood obesity is not good parenting. Pointing out business/government conflicts of interest – It is expected of corporations to increase the value for the shareholder. This is inevitably linked to funding research which back their products and services. Businesses also lobby for/against products which will help them, even if they hurt the public. Take care of your body and treat it well. Get plenty of rest, exercise, laughter, non-processed food and clean water. You are literally stuck with your body for the next 80 years. It makes sense to take care of this wonderful machine as best you can. Question what the “experts” say. Listen to *your* body and pay attention to what different foods do to your body. The government food pyramid pushed bread/cereal for years when clearly fruits/vegetables are more healthful than packaged bread on a shelf. 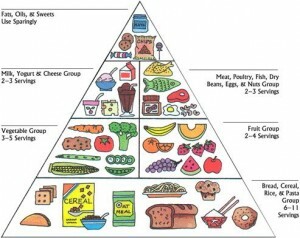 How many people suffered as a result of this erroneous food pyramid? Your children are your responsibility – Ronald McDonald is not supposed to raise your children. As a parent, you have the power to control what television they watch, the amount of exercise they get and the food they consume. Blaming McDonald’s for youth obesity is not acceptable. Understand that “spin”/conflicts of interest go hand in hand with having a government – If you have a large, powerful government which influences the behavior of many individuals, it is essential to realize that this power structure will always be manipulated for personal gain. Rather than hand-wringing or trying to counter-influence this power-structure, simply unplug from what the experts say and make your own decisions. A sense of skepticism is a great tool to have. CSPI pushes a vegetarian agenda. Agribusiness is pushing a grain heavy agenda. Scientists, like all individuals, are self-interested. They will research what they are paid to research. As long as there is government, there will be those who try to influence government. Get used to it. A computer programmer named Tom Naughton produced this movie. He’s a regular, geeky guy who put his name and reputation on the line. He was interested in generating something of value and sharing it with the world. Kudos to him for following through on his ideas and creating this excellent film. To read more about men sharing their talents, click here. While watching basketball, I heard a wonderful Gatorade commercial featuring John Wooden reading the poem “The Little Chap Who Follows Me”. The poem describes the burden a father carries to create a positive impression on his son. There are countless things my father did to set a positive example. I can’t count the number of times he could have taken the easy way out, acted carelessly or thoughtlessly. I can definitely attest that I was the “little chap” who followed him because of his behavior. He set the bar extremely high, which is why I feel obligated to match it. Doing the right thing, however small and inconsequential, is not often rewarded or noticed. It is often the tlittle things like telling the truth when it’s inconvenient or going above and beyond to increase the comfort of your family that make a big impression on a “little chap”. To read more about caring for your family, read here.